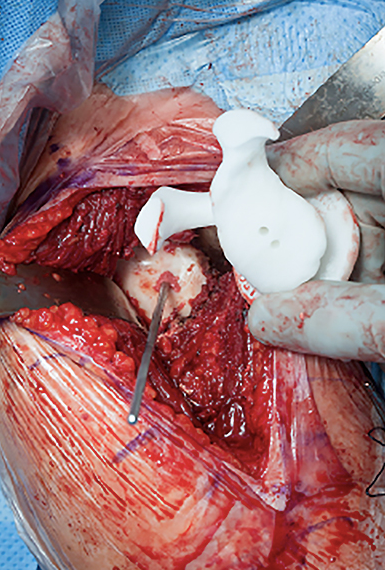 Total shoulder replacement has clinical efficacy for the treatment of primary and secondary degenerative conditions of the shoulder. It has excellent surgical outcomes, providing long-term pain relief and improved function for the majority of patients. It is also a demanding procedure, with known complications. Failure of the glenoid component of the implant is one of the most common and worrisome complications in the mid to long term. Glenoid component failure can result from anatomic factors such as glenoid version or rotator cuff insufficiency, from fixation problems, or from the component itself — for example, metal-backed versus cemented polyethylene glenoids. Inaccurate component positioning is also a critical factor in long-term implant survival; improperly placed implants increase the risk of instability, wear and loosening and the need for revision surgery, which is typically more challenging and less successful than the primary operation. Proper glenoid placement in terms of version and inclination is difficult, however, especially in the presence of complex and irregular patterns of glenoid bone loss with unreliable landmarks. 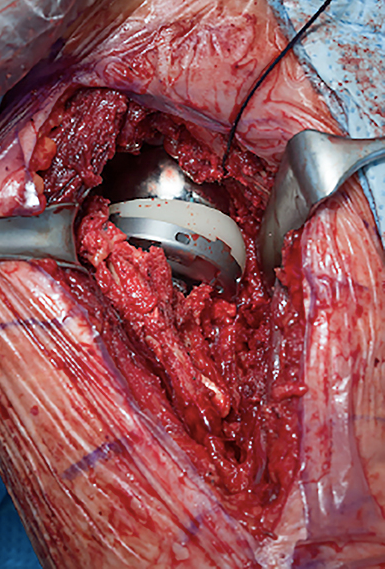 When reverse arthroplasty is performed in these cases, directing the glenoid baseplate along an axis with enough bone stock for fixation can be a daunting task. Joaquin Sanchez-Sotelo, MD, PhD, an orthopedic surgeon specializing in shoulder and elbow surgery at Mayo Clinic’s campus in Rochester, Minnesota, observes that the classic method of using standard X-rays to estimate areas of missing bone and guide placement of the component in space is imperfect. Three-dimensional (3-D) computer planning for implant placement originated with early studies investigating whether 3-D imaging helped surgeons better identify glenoid bone loss. In the current process, 2-dimensional CT images of a patient’s scapula and humerus are uploaded into a software system, which reformats them into accurate 3-D models. This allows far better visualization of the glenoid cavity than conventional X-rays or 2-dimensional CT. It also allows surgeons to clearly visualize and consider preservation of support bone, implant version and inclination angle, and glenoid contact for each patient. 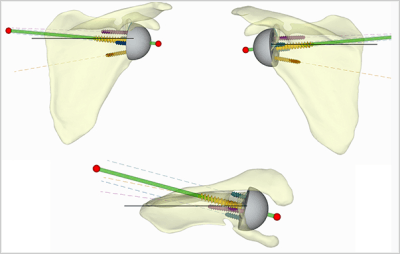 A large body of research has demonstrated improved glenoid orientation with the use of preplanning software; most studies demonstrate average derivations in version and inclination of 5 degrees or less from the intended component position. John W. Sperling, MD, MBA, also an orthopedic surgeon specializing in shoulder surgery at Mayo Clinic’s campus in Rochester, Minnesota, notes that the large volume of complex cases seen at Mayo Clinic has helped drive innovation in this space. “This is an extremely powerful tool because it allows movement of the component to show varying degrees of orientation. It is especially helpful in cases with marked distortion of anatomy and significant bone loss,” he says. Patient-specific instrumentation (PSI) allows surgical implementation of the preoperative plan through the use of patient-specific guides that direct glenoid implant placement and fixation, including positioning and orientation of the implant, the reaming depth and angle, and the trajectory of drilling for screw placement (Figures 1-4). Figure 1. PSI allows surgical implementation of the preoperative plan through the use of patient-specific guides. Figure 2. PSI for placing the shoulder arthroplasty. Figure 3. Instrumentation helps direct the guidewire in the correct version and inclination. Figure 4. Placement of a short stem uncemented reverse arthroplasty. Several vendors offer PSI, and the types of instruments vary considerably, including pin guides versus cutting guides, a greater or lesser degree of surgeon input in the preplanning process, and various types of imaging for the 3-D model. It is unclear whether any is superior, and the choice depends mainly on cost and physician preference. Many groups have reported on the use of PSI for shoulder arthroplasty, with generally positive results. A randomized controlled trial published in the December 2012 edition of The Journal of Bone & Joint Surgery  compared PSI with standard instrumentation for glenoid placement. 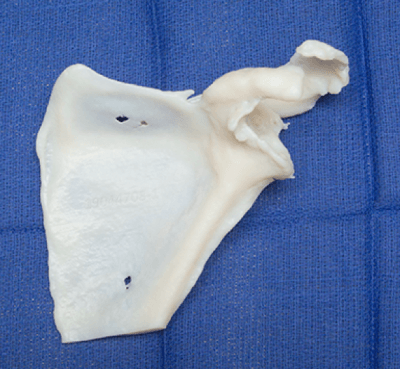 Overall, the PSI group had fewer incorrectly positioned glenoid components and significant improvement in the selection and use of the appropriate implant for patient anatomy. 3-D printers use computer software to create physical objects from CT data. In the last decade, technologic advances have lowered the cost of 3-D printers, thereby expanding their use (Figures 5-6). 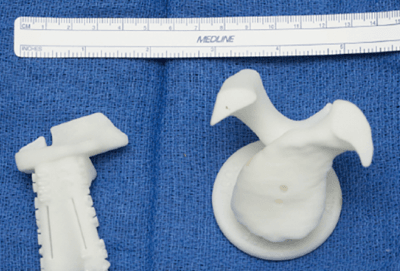 Custom 3-D-printed implants have been used in femoral and tibial hemiarthroplasty, and in 2015, surgeons at Mayo Clinic’s campus in Arizona performed bilateral total hip arthroplasty using 3-D-printed implants for a patient with a bone growth disorder who was too small for conventional hip implants. Figure 5. 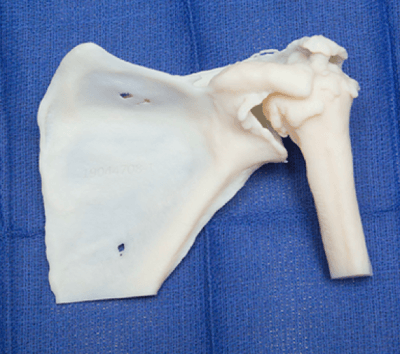 3-D printed scapula. Figure 6. 3-D printed shoulder. Computer planning programs and PSI appear to increase accuracy and efficiency, minimize outliers, and slightly lower operative time and costs. But they have not been proved to be cost-effective, and whether the added cost will be clinically beneficial in the long-term is a matter of debate. Dr. Sperling says computer planning and PSI are generally reserved for patients with complex anatomy, including dysplasia, bone deficiency or deformity secondary to prior trauma. Preoperative planning and patient-specific instrumentation improve accuracy of shoulder arthroplasty. Republished from Mayo Clinic Orthopedic Surgery Physician Update (available from MayoClinic.org) with permission of Mayo Foundation for Medical Education and Research. Hendel MD, Bryan JA, Barsoum WK, et al. Comparison of patient-specific instruments with standard surgical instruments in determining glenoid component position: a randomized prospective clinical trial. J Bone Joint Surg Am. 2012 Dec 5;94(23):2167-75. doi: 10.2106/JBJS.K.01209.